I love these shirts so much I bought a handful. Soft, lightweight cotton in a borrowed-from-the-boys fit. More often than not, these amazing bargain finds are even more special to me than something priced 100x more. Forever 21 top here. Super soft, stretchy, and supremely flattering J Brand super skinnies make for one happy mama. These affordable 2 inch-high pointy suede pumps were a steal at HM. Similar here. Loved the softness and feel of this camel colored scarf from HM. Similar here. 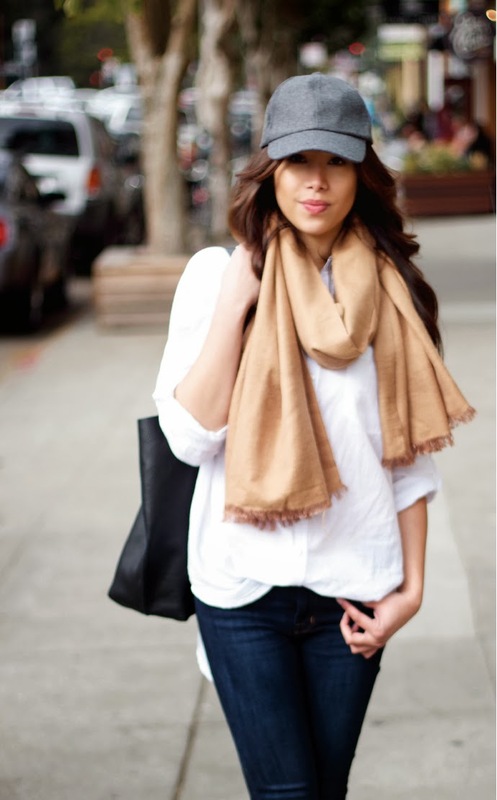 Whether its to hide a bad hair day, or bags under my eyes - a good hat or cap is essential. Forever 21 wool cap. My Cuyana tote is perfect in every way. I can take it anywhere, wear it with everything, and rock it night and day. This list is proof that closet staples don't need to cost an arm and a leg ;) Look beyond the tags, name brands, and sizes - you'll be surprised at how easy it is to shop for timeless favorites. What are your go-to classic pieces? Thanks for dropping by!